I’m particularly excited to present this transcription today. It is the recently obtained probate record of my 6th great grandfather, Johann Eberhard Martin, born Jan 1718 in Willington, Notzingen Donau, Wurttemberg, Germany, died February 1784 in Derry, Cumberland, Pennsylvania. Johann apparently went by the name Everhard or Eberhard in most records and documents once he came to the United States. However, his baptismal record from Germany does give his first name as Johann. Johann Eberhard Martin married Jacobina Elizabeth Wunderlich on 16 Feb 1745 in Notzingen, Teck Donau, Wurttemberg, Germany. They had 5 known children: Mary, Rachel, Christopher, Anna Barbara and Elizabeth. Yesterday while looking at Pennsylvania probate records on Ancestry.com I located Eberhard’s probate record. I was very excited to find this document. This record gives proof of relationships and further documents this family. Here is my transcription of this probate record. Where a word or words were not readable I inserted an underline. I cannot wait to share other probate records with you. Stay tuned. I have been going through my own “Do Over” and trying to make sure I have as many vital records as possible for each person in my tree. No easy task to be sure. But, slow and steady is the key and a little work each day will get the job done. I was working on my husband’s side of the family and noticed that I didn’t have death certificates for his grandparents. They both died right here in San Diego, where I live. Several cousins also live here in the area. Maybe one of them have the death certificates? NOTE: Sometimes it is the family closest to us for whom we don’t have complete records. Like my siblings marriage records (still need to obtain those), these death records for Ron’s grandparents etc. How about our own birth certificate or school records? Have you recorded and scanned those? I did contact the cousin who has provided me with all of the records I have for Ron’s family and she directed me to her daughter. I made the request yesterday and this morning there they were, in my email. Genie happy dance for sure. Now I have a cause of death, more evidence of parent’s names etc. Another find today was a probate record for Ron’s great grandfather. More on that in another post. Suffice to say, it’s been a great morning here in the genealogy cave. WEDDING WEDNESDAY–What is the earliest recorded marriage in my tree? I decided that today I would look in my Legacy database for the earliest recorded marriage. Since that list was so large I narrowed it down. Let’s narrow that down even more. I’m a little surprised to find so many before 1700. There are only small portions of mine and my husband’s family that I’ve traced back to the 1600’s. Narrowing it down a bit more. about 1588 – Francis HALL to Elizabeth LNU – My husband’s 9th great grandparents. 3 Feb 1606 – Francis HALL to Margaret LEWIS – My husband’s 8th great grandparents. Source: Familysearch.org (I last modified this couple on 20 Apr 2009) This means I need to go back and find that source and properly record it. Before 1611 – Samuel MORSE to Elizabeth JASPER – My husband’s 9th great grandparents. 1638 in Dedham, Massachusetts – Joseph MORSE to Hannah “Anne” PHILLIPS – My husband’s 8th great grandparents. 1641 in England – Joseph CLARK to Alice PEPPER – My husband’s 8th great grandparents. 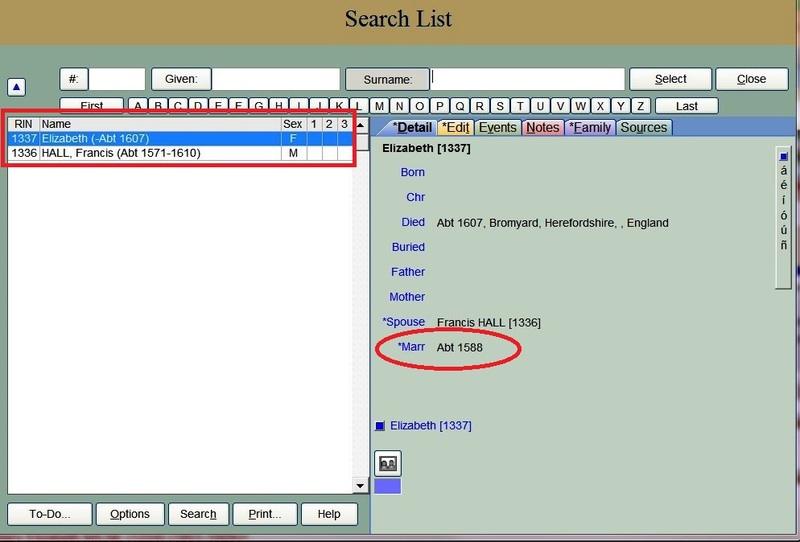 UPDATE: Thank you to Michele Simmons Lewis (who is tech support for Legacy) for pointing out another very quick way to find the earliest marriage in your database. In your Legacy 8 file to go the Tools tab, then select Statistics. As you can see this shows me 1 marriage between 1500 & 1599. There you have the exact marriage that occurred between those dates. That's much easier than the method I originally used. Thank you Michele for reminding how much information is at our fingertips via the Statistics List. As you can see, these couples are all from my husband’s line. I’ve had a lot more luck tracing his family back before 1700, than my own. Looks like I need to go and hunt down the sources for the two I have “none” for and verify the one I found on familysearch.org. What is the earliest marriage you have recorded? How are they related to you? Please let me know in a comment or on your own blog post. In keeping with last week’s post about finding our ancestors who served during military conflicts, I am posting some headstones of Civil War veterans from our family. Here are 6 headstones indicating their military service during the Civil War. Thank you to all of my ancestors who fought during this very horrible time in our nation’s history. I sometimes try to think what it must have been like to live in the northern, midwest and southern states during this war. I know it even affected those out west. Military records can be one of the best resources we find for our ancestors. Whether it’s a draft registration, a pension file or a service record, they can tell us a lot about that ancestor. That is only a partial list. But, you can certainly see how important these records can be. SO HOW CAN WE FIND OUT WHICH OF OUR ANCESTORS MIGHT HAVE PARTICIPATED IN WHICH WAR? I use Legacy 8 as my software database and this is the method I used. I’m sure other software programs have similar finding aids. For a detailed, step by step lesson on how to create your search criteria, please see my post here - Legacy 8 - The Search Function - What Can You Find? NOTE: Of course there were women who served during the wars. Especially the later wars. However, for now I wanted to concentrate on the primary possibilities, which are the men. Now I actually have a list I can use for each of the wars. I can check the list one by one and look for military records. Rather than my usual method of remembering to do that as I’m researching a particular person. I can indicate in my To-Do list in Legacy that I have completed this task. Or, I could make a notation in the ancestor’s “research notes.” Or you could keep track some other way. Because some of the lists are multiple pages, I would not personally print them out. You might choose to. I did create a PDF version of each list, which you can do directly from the “Print” option at the bottom of the page of names. Here is a compilation of how many names appear on each list that I created. That’s a grand total of 2570 men who could possibly have military records. I will be able to quickly eliminate from each list, those who died at birth, died as infants or before they were military age. There could be several who overlap and could have served in more than one war. My database contains 4719 individuals. Now to determine where to start and how to proceed. Do you think this is a valuable list? Is it something you could use? Please share your results with me if you choose to create such lists. The idea for this post comes from … of course … Mr. Saturday Night Genealogy Fun himself, Randy Seaver of Genea-Musings. Randy so often gives us fun ideas. Here is tonight’s assignment as posted on Randy’s blog Saturday Night Genealogy Fun – Genealogy Bling. This is directly from Randy’s blog post so I don't miss anything. 1) Go to the www.ImageChef.com website and explore their FREE offerings. Click on the "Create" button, or choose to make a slideshow or posters from their main page (there are more than one screen of poster backgrounds). 2) Make one or more posters, piece of jewelry, tattoo or other creation - perhaps they relate to genealogy or your own family history. Be sure to check the Photo Frames and Fun template collections. Save them to your computer (right click, Save as Picture for Windows users). 3) Show your creations to us... in your own blog post, on a Facebook post, or on Google Plus etc. A note for my husband…..hahahaha! This has been fun. Thanks Randy. Will you join us in some Saturday Night Genealogy fun? Since today, September 11th has become a date that all of us currently old enough, will always remember. I thought I would look at family statistics and see what events in my family took place on this date. I wanted to write something to honor this date. WHICH MEMBERS IN OUR FAMILY WERE BORN, GOT MARRIED, DIED OR HAD SOME OTHER EVENT OCCUR ON THIS DATE? Here is the list created by Legacy for events on September 11th. We had 6 births on this date – the earliest one in 1773 – Horace Flower, my 2nd great grandaunt’s husband’s grandfather. There were 8 marriages on this date – the earliest on in 1828 – Rachel Hudson married William Dysard. Rachel is my 4th great grandaunt. There were 4 deaths on this date – the earliest one in 1777 – Mary Leavitt, my husband’s 6th great granduncle’s wife’s daughter. There were 4 other events that occurred on this date. The earliest one being the proving of the will of Anthony Bowen, my 5th great grandfather AND my DAR Patriot. His will was proved in 1787. Three of the oldest events on this list occurred in the 18th century. There are two events in our family that occurred the day before and the day after September 11th. The birth of our grandson and the birth of my stepson. Are there dates in your family that have occurred on memorable dates in history, such as December 7th or November 22nd, to name a couple? We all know that church records are a valuable source of information about our ancestors. They are likely the only records in existence for births, baptisms, marriages and deaths, in the 17th, 18th and part of the 19th century. I have quite a few of those records, from both the U.S. and over in Scotland. However, I’ve recently discovered a new branch of the family, the Cooper’s, who were members of the Dutch Reformed Church in New York. Apparently, for several generations. With that came the discovery of a database on Ancestry.com for the U.S. Dutch Reformed Church Records, 1639-2000. I’ve been able to find baptisms for whole families and marriages. These records go back as far as 1691, so far, for my family. And the best thing……….THEY ARE ALL WRITTEN IN LEGIBLE HANDWRITING. At least that has been my experience so far. Here are a couple of examples. I haven’t changed the color of the pages. I would normally make them black & white, but wanted you to see them just as they look on the database. This is the explanation from Ancestry.com about this database and it’s contents. This database will be comprised of records from the Reformed Church in America. This database will be updated with content from other states, and currently includes records from New York, New Jersey, and Pennsylvania. Founded in New York City in 1885, the Holland Society is home to collections relevant to the settlement and history of Dutch colonies in America, with an emphasis on New Amsterdam and Hudson River settlements. This Holland Society collection includes records of the Dutch Reformed Church dating back to 1642. Within the collections are records of baptisms, marriages, and burials, primarily from New York, with some from New Jersey and Pennsylvania. For more information see the Holland Society. Here is a link with more of an explanation about these records from familysearch.org. This article contains many helpful links. I checked on familysearch.org to see if I could locate these records, since they are free and not everyone has a subscription to Ancestry.com. The answer was YES, they are available, but only with an index, NO image. Here is Abraham Cooper’s christening record from familysearch.org. Would this still be helpful information. Absolutely! My plan is to use both of these websites to gather as much information as I can on this family. We know that sometimes different sites have varying indexes and I don’t want to miss any records. I hope this has been helpful to you. Until I discovered this family I had no idea we had any Dutch Reformed Church members in my lineage. Here is my post about finding this branch in my tree, thanks to a generous member of a Facebook group I belong to. Here is a post I wrote about how Facebook can help us with our research. SURNAME SATURDAY–COOPER–Have I really gone back 3 more generations? Last week I wrote about one of my brick walls on Mystery Monday – Who’s Your Daddy? – Lany Cooper Thorp 1815-1866. I often share my blog posts on different groups as they apply to the ancestors and locations I am writing about. In this case it was the New York Genealogy Network group. This group has been helpful in the past and this time was no different. A comment was made and the member told me she would be going to the Cayuga Historian’s office in the next week or so. She sent me a private message and was kind enough to offer to look for records for me. Not only did she step up to help, but another member posted an obituary relating to this family. About a week later I received an email from the generous member who went to the Cayuga Historian’s office. She had located a probate record for Jacob Cooper naming Polly Byrne as his wife and several children, including a daughter Lana. I was SO excited to receive this information. This gave me further evidence that Lany Cooper’s parents were Jacob Cooper and Polly Byrne, as stated on her death certificate. Now to find more information on this family. I spent yesterday looking online and was rewarded with historical records, newspaper articles and family trees that led to more records. That’s all any of us can ask as we research our families. Last evening while I was using my iPad and watching TV, I located many newspaper references to this Cooper family on Genealogy Bank, and I plan to pursue those articles this morning. I just had to share this genealogy moment with all of you. This is what I’ve discovered and will be verifying in the next several days. Obadiah Cooper and Cornelia Gardenier are probably my 7th great grandparents. Prior to this I had only gone as far as my 4th great grandparents, Jacob Cooper and Polly Byrne, and they had not been confirmed. NOTE: I was able to locate the probate records that had been sent to me, on Family Search. I have since found other records on the site for this family. This just tells me that I should concentrate on one line at a time, more often than I do. I admit to being very easily distracted and have shared this with you before. If you think you may be related to anyone mentioned in this post, please contact me. I'd love hear from you. I hope you all have a very successful Labor Day weekend looking for your own ancestors.